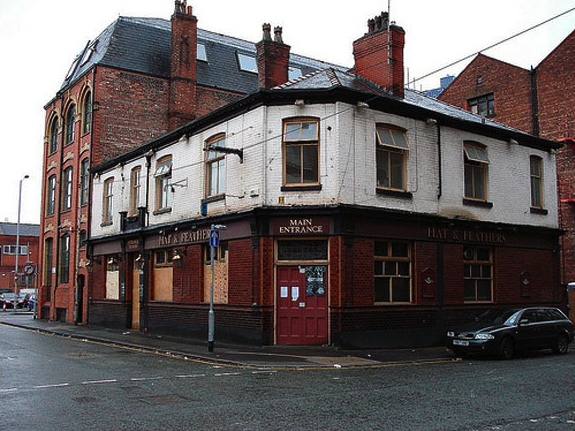 Hat and Feathers Public House, 39 Mason Street, Ancoats (M4 5FX) before demolition. Courtesy P. Stanley. 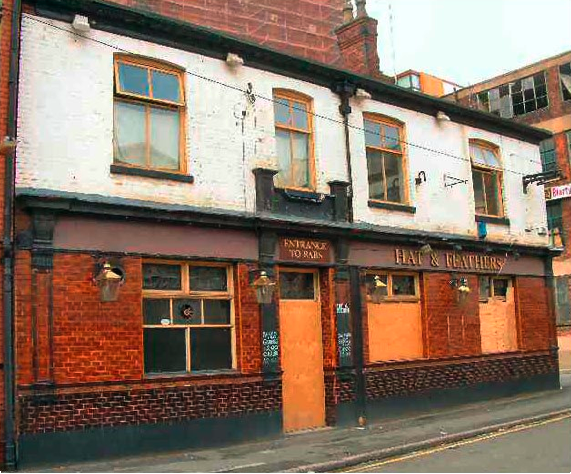 After standing for over century, the Hat and Feathers was demolished on 18th July 2009 and replaced by a car park. The same fate that has saw off many of Manchester’s greatest architectural treasure, such as the modernist masterpiece York House , which regrettably was demolished in 1974. After demolition the rather ghostly shadow hangs over the car park run by SIP Car Parks Ltd. © 2012 historyme. The Hat and Feathers was a rare example of a Victorian possibly Georgian corner back street public house in the area of Ancoats; with it’s traditional layout and fine exterior tiling dating from at least 1841 when it was run by publican John Jackson (Pigot & Slater 1841); listed as the Hat and Feather at number 13 Mason Street. John Jackson stayed there for no more than nine years and by 1850 Thos. Doyle (Slater 1850) had taken over. Mason Street at this time would have been a hive of activity and very much what would many would recognise as a traditional high street today. Strewn with small busy local shops and cobbles underfoot. Meanwhile, Manchester had gone global and had become the first and greatest industrial city in the world. 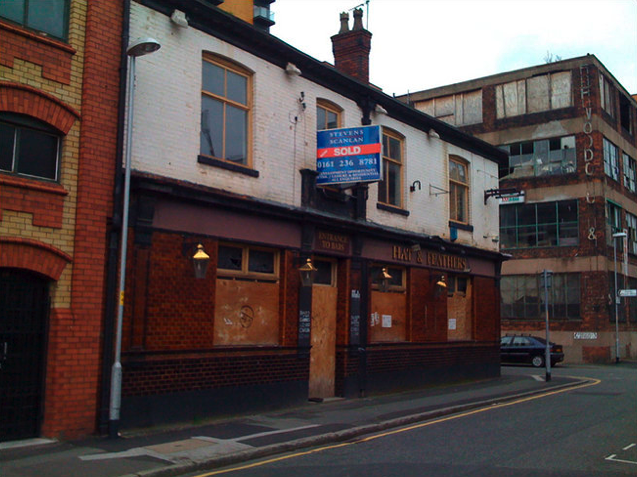 The Hat and Feathers before demolition from Mason Street. Courtesy P. Stanley. The Hat and Feathers for sale with Steven Scanlon. Courtesy P. Stanley. By 1863 there was a new landlord called David Sloane (Slater 1863) and the Hat and Feathers was now listed at 15 Mason Street. By 1876 is the Hat and Feathers landlord was Maria Sloane (Slater 1876). Maria Sloane continued to run the pub to at least 1886 (Slater 1886), but by 1895 publican John Proudler was in charge of the Hat and Feathers. It was also now listed as being at numbers 15 & 17 Mason Street (Slater 1895), indicating possible expansion when two buildings could have been knocked into one . The pub could have been possibly older. A combination of property speculation and poor management and subsequent fire damage finally sounded the death knell on this historic architectural gem of Ancoats, when an application for demolition was submitted on Friday 28th November 2008. Detail of some of the fine tiling. Courtesy P. Stanley. The Hat and Feathers also fell within an area within what Manchester City Council refers to as ‘character areas’, or an ‘area of change’ and so the planned 7 storey building apartments for students with a Class A1 shop at ground level with basement car parking would meet the requirements of Collyhurst Local Plan, although how the new build would “exploit the historic character of Mason Street” as well as enhancing the character and appearance of the street scene” is unclear. Eric Mason celebrating his prison release after a drug related conviction. Courtesy P. Stanley. 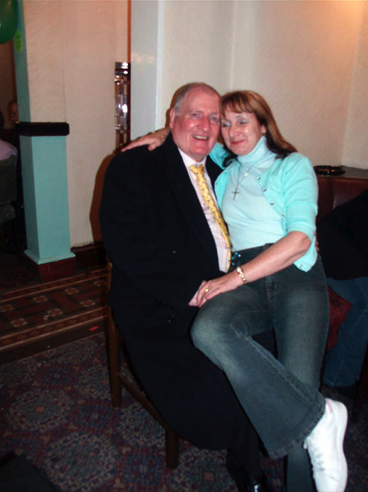 Before the Hat & Feathers was demolished, for a number of years the pub had entered into the dark annals of British criminal history, by becoming the second home to London gangster, Eric Mason, who had moved to Manchester to be closer to friends and family. Maybe it was the street name that attracted him or the familiar surroundings of traditional pub, that wouldn’t have looked to dissimilar to the many pubs he would have visited during his past criminal career in London. Mason was once one of London’s most notorious gangsters and long time associate of the notorious Kray twins during their criminal heyday in the 1950s and 1960s. 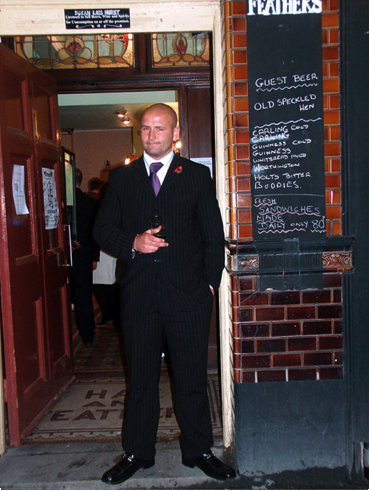 Doorman at Eric Mason’s homecoming party showing fine tiled flooring and stained glass behind. Courtesy P. Stanley. The finely tiled corner entrance door before demolition. Courtesy of P. Stanley. The name Hat and Feathers may derive from industries in the local area or more likely may refer to the emblem of the Prince of Wales who was the Commander in Chief (Prince George, Duke of Cambridge – 1819-1904), whose heraldic badge is a trio of feathers. Feathers would traditionally be worn in caps of regiment soldiers. Pigot & Slater (1841). Pigot & Slater’s Directory of Manchester & Salford, 1841. Manchester & London: Pigot & Slater’s. p105. Slater (1876). Slater’s Directory of Manchester & Salford, 1876. [Part 2: Trades, Institutions, Streets, etc. ], 1876. Part 2. Manchester & London: Slater’s. p169. Slater (1886). Slater’s Directory of Manchester & Salford, 1886. [Part 2: Trades, Institutions, Streets, etc. ], 1886. Part 2. Manchester & London: Slater’s. p249. Slater (1895). Slater’s Manchester & Salford Directory, 1895. [Part 2: Trades, Institutions, Streets, etc. ], 1895. Part 2. Manchester & London: Slater’s. p213. Unknown. (Jan 2010). Manchester, the First Industrial City 1760 – 1830.Available: http://www.grimshaworigin.org/ManchesterIndustrialCity.htm. Last accessed 25th Oct 2012.
http://www.thegeordieconnection.com/ericmaison/index.html &#8211; website no longer available. Last accessed 3rd Jul 2010. My great great great grandfather John Jackson in 1841 is listed as being a publican. The name of the publican of the Hat and Feathers in 1841 is down as John Jackson. My problem is he lived in Jackson Square in Salford in 1841. At this address it just says publican there is not a name of a pub. Can you help please. Thank’s for the memories:) Me and a few of the lads used to frequent the Hat & Feathers when I worked for Eugene Elliots which was just round the corner. I was there from about Oct 1970 – Apr 1971. We had a great snowball fight right outside the front door around Christmas time. Very nice to hear from you. Apologies for the delay, we’ve been very busy campaigning to save Ancoats Dispensary from demolition. 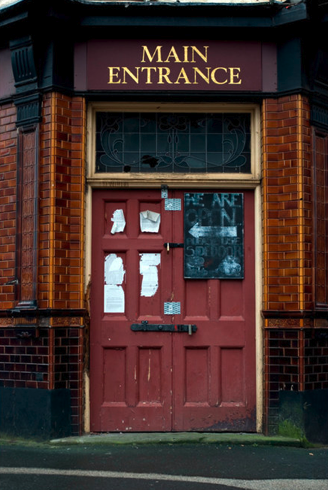 I use to go in there myself, a but later than yourself, but a great pub and it have a lot of potential. 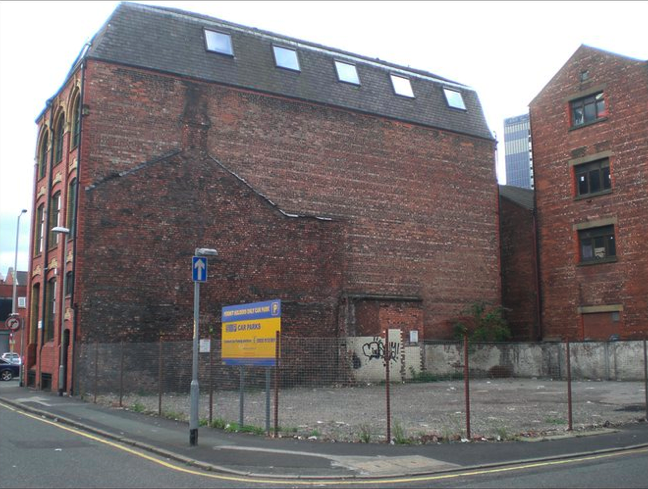 Sadly the pubco who owned it typically got greedy and with zero interest in history or the community of Ancoats got permission to demolition it and now its a car park! Would love to hear more about your time at Eugene Elliots (historyme@inbox.com) and if you have any picture or more stories about your time at the Hat and Feathers it would be great to see and hear them. I imagine the snow ball fight was great fun, especially if it came after a night in the Hat and Feathers. Just dropped by again and read your comment. Sorry, I have no photos:) If I did I would gladly post them. Thanks again for the memories: Benny. Hi Benny. Nice to hear from you again and likewise thank you for your memories too. I will be doing some future posts on Smithfield Market and hope you will add your memories of the place. Once again, thank you for getting back in touch and glad you liked the post. Historyme I reckon most of it went to reclamation. I’d at least hope so. Be a shame to at not least do that. The tiles are really distinctive. The Nelson which was demolished had them internally, which is quite rare in Manchester City Centre, if not Manchester generally. Just shows you what is being lost. There are not many pubs with a corner entrance left either, such as seen in the late Hat and Feathers, not to mention the tiling. A report commissioned by the British Tourist Board, Visit Britain, said tourism to our museums and galleries, basically history and culture was worth in excess of £1 billion and is set to rise by 60% to £188 billion over the next decade. Looks like little of that will be spent in Manchester since we are not interested in either of those things! Marc Citizen Corinthian Starr Do you reckon they carefully removed that gorgeous Art Nouveau stained glass before they demolished the place? 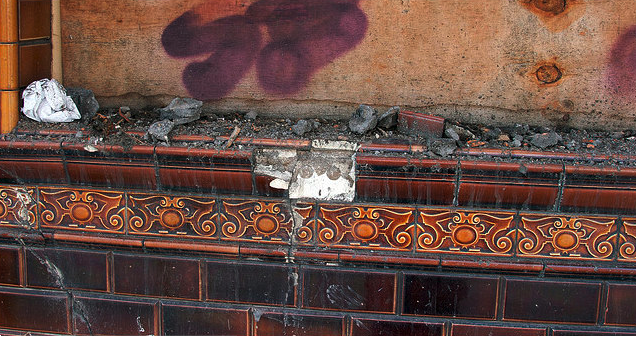 This makes me want to go to old pubs with a hammer and chisel just to salvage a few of those old tiles. Do you reckon they carefully removed that gorgeous Art Nouveau stained glass before they demolished the place? This makes me want to go to old pubs with a hammer and chisel just to salvage a few of those old tiles. Yeah, I imagine they would have been salvaged. I hope so at the very least. Its waste enough to destroy a perfectly sound building, then not to recycle materials.